Exeter Cathedral, the Cathedral Church of Saint Peter, is an Anglican cathedral, and the seat of the Bishop of Exeter, in the city of Exeter, Devon, in South West England. Claude Buckle captures the view from the Palace east side. This carriage print is painted in water colour. Created in 1952. From an engraving by R Sands. 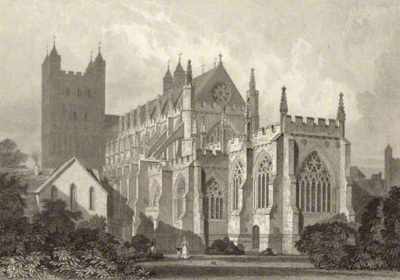 South East view of Exeter cathedral 19th century.